Flowers have an almost endless array of colors, shapes, and sizes, and they usually make gorgeous photographic subjects. I'm coming to enjoy taking photos of flowers more and more, and find myself seeking out new ones anytime I can. Once again, I'm an amateur and have very limited photo/camera knowledge (I stick to the Auto feature on my inexpensive digital camera) but have been more than amazed on many an occasion at what I have managed to capture. 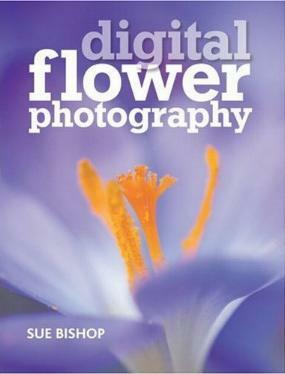 In this book, not only are we able to enjoy Sue Bishop's fantastic pictures, she tells us about the different cameras we can consider when buying a new one, lenses, accessories, exposures, light, and composition among other topics. The flowers, mostly close-up images, are spectacular in their color, composition, and effective blurring - my kinds of photos but not always easy to achieve. Ms. Bishop also sells her work as greeting cards. I can easily visualize some of her flower photographs enlarged into huge wall posters as the colors are superb and would brighten up any room. Conclusion - Simply stunning. Highly enticing to the budding (no pun intended) flower photographer.